“We recently worked with curious for the first of many projects. Their insight, understanding of our client’s audience and knowledge of the web is excellent. I found Marie to be one step ahead in knowing our needs in order to deliver a really fantastic site for our client. While it was a collaborative effort and layered project, curious made it a simple process which was enjoyable and fun to engage in. 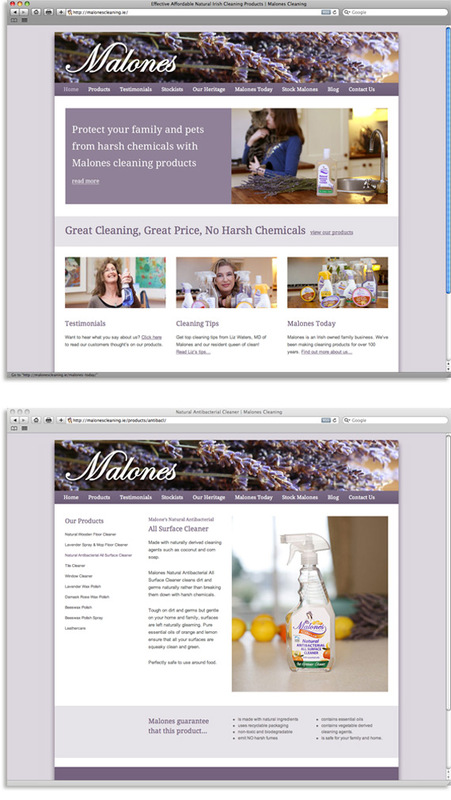 Malones is an Irish company who have been producing natural cleaning products for over 100 years. Working with Pivotal Communications and photographer Magda Lukas we designed and developed a site to help Malones showcase their product range and engage with their customers. Built in WordPress, the website and blog are easy to maintain and update. Malones are well known for their lavender furniture polish and they use citrus and lavender essential oils in many of their products. They wanted to emphasise these natural ingredients without being perceived as a niche range. We used a mix of lavender tones and beautiful natural lifestyle and product photography to position Malones as a natural but mainstream alternative to harsh cleaning products.